• Protect motor movements, assembly areas, and supply trains in a bivouac. • Defend against hovering rotary aircraft. • Fire on suspected enemy positions. • Provide high volumes of fire into an engagement area (EA). 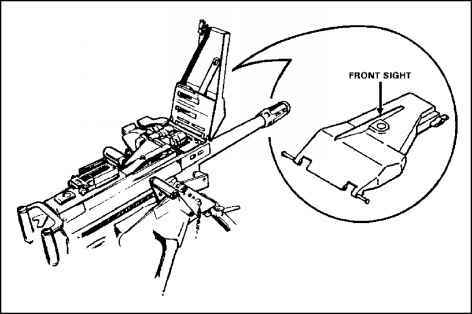 The MK 19 is an air-cooled, blowback-operated machine gun with five major assemblies (Figure 1 -2). A disintegrating metallic link belt feeds ammunition through the left side of the weapon. Tables 1-1 and 1-2 provide MK 19 technical and operational data, respectively. 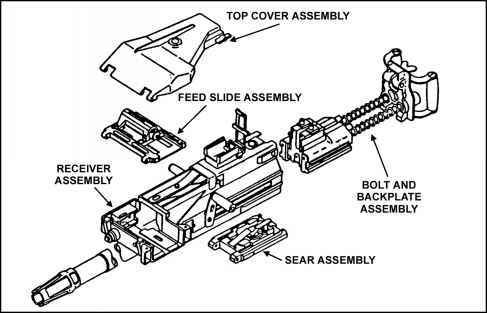 a. Receiver Assembly. Holds the barrel and other parts of the gun. Ammunition is fed into the left side of the receiver through the feed throat assembly. The MK 19's barrel will not overheat, even after prolonged firing. b. Feed Slide Assembly and Tray. Holds the rounds in the feeder and indexes the ammunition into position for delinking. c. Top Cover Assembly. Holds the feed slide assembly and tray. It is opened by a latch (left side) for loading or to clean and inspect feeder area. A blade-type front sight is attached to the top cover assembly (Figure 1-3). d. Sear Assembly. Holds the receiver sear. Trigger action releases the sear and allows the bolt to go forward. The safety is attached to the sear assembly. e. Bolt and Backplate Assembly. The bolt fires the round when the sear is depressed by trigger action. The recoil springs drive the bolt forward on the receiver rails. The guide rods hold the springs in position. Trigger and handgrips are located on the backplate assembly. f. Feed Throat Assembly. Allows smooth feeding of 40-mm ammunition. It attaches to the forward left side of the receiver by two sets of spring-loaded retaining pins. Without a feed throat, machine gun stoppages may occur because of twisted or misaligned rounds. g. Leaf-Type Rear Sight (with adjustable range plate). Is marked in 100-meter intervals from 300 to 1,500 meters. The sight is mounted on a spring dovetail base to the receiver assembly (Figure 1-4). Before moving the weapon, the gunner folds the sight forward to a horizontal position. 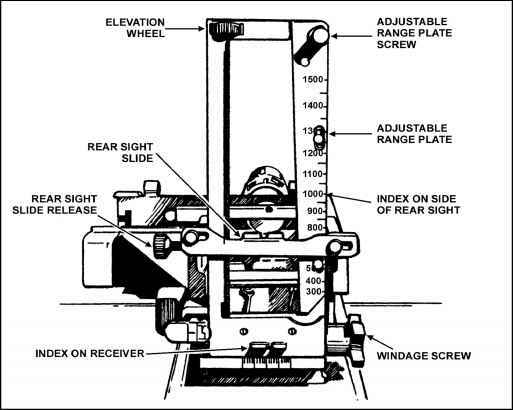 The rear sight can be adjusted for range and windage. (1) Range. Different adjustments can be made to the range. Use the rear sight slide release to make major adjustments to the range. Use the elevation wheel to make fine adjustments to the range. (2) Windage. Use the rear sight to adjust for windage. One click equals a 1-mil change. To move the sight to the right, turn the windage screw clockwise. 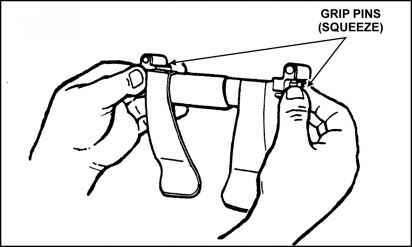 To move the sight to the left, turn the windage screw counterclockwise. Figure 1-2. Five major assemblies. Figure 1-3. Front sight on top cover assembly.